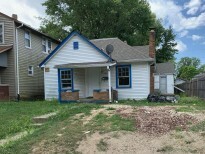 View - 2444 N Oxford St.
3 bedroom,1 bath with basement. Huge master suite w/walk in closet & separate entry that leads to covered porch. Big living room w/brick fireplace. Formal dining room, kitchen and nook! Will need some repairs, but for this square footage it's a great opportunity!